It's time to hit the road! 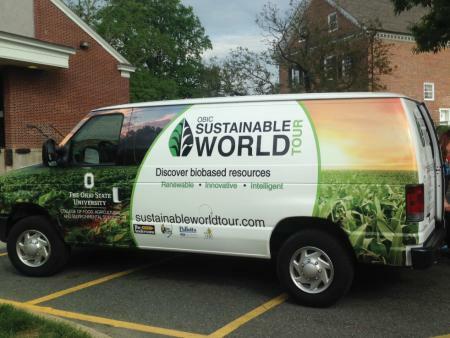 Follow the Sustainable World Tour van as it travels across the country between Christmas and New Years, promoting biobased products and a more sustainable lifestyle. Each day we'll be updating this page with dispatches from the road. Join us as we make stops in Missouri, Oklahoma, Texas, New Mexico, Arizona, and beyond! Early this morning (Dec. 26th), I loaded my suitcase in the Sustainable World Tour van and headed west on I-70. After making a couple stops for fuel and the obligatory photo with the World’s Largest Rocking Chair, I finally made it across the mighty Mississippi River to St. Louis, Missouri where I picked up Matthew Katterman, a Ph.D. student at the University of Arizona and Student Delegate of the Consortium for Advanced Bioeconomy Leadership Education (CABLE). With Matthew along for the ride, we set out for the University of Missouri where we will tour the recently renovated Agricultural Engineering building tomorrow morning, accompanied by Dr. Leon Schumacher, professor of Ag. Engineering and CABLE Faculty Mentor. After traveling some 600 miles today, we were thrilled to retire to our hotel room for the night. Matt and I started our Wednesday morning at the University of Missouri accompanied by Dr. Leon Schumacher, a Professor with Missouri's Agricultural Systems Management. Dr. Schumacher led us on a tour of the recently renovated Agricultural Engineering Building where we were able to explore equipment designed to produce biofuel from shrimp waste and algae. The University of Missouri was able to update their Ag Engineering facility and build a scaled-down grain elevator simulation thanks to donations from ADM. The University is equipped with a unique wood fire power plant that has been engineered to produce electricity at 66% efficiency. The three of us visited the university’s research farm as well as Sanborn Field. Sanborn Field is a plot of land in the middle of Mizzou’s campus that has been growing corn consistently since 1888, that’s longer than any other plot of land in the United States; it is also the location where Aureomycin, a common antibiotic, was first discovered. After Dr. Schumacher showed us to some local cuisine, Matt and I departed for Muskogee, Oklahoma, our resting place for the night. In the morning we will drive to Dallas where we will meet up with OBIC director, Dennis Hall for some pre-Cotton Bowl activities. We made it to Arlington by midday, just in time to watch TBDBITL battle the spirit of Troy, USC’s marching band, in the Battle of the Bands at a park. We met up with OBIC Director, Dennis Hall, and drove across town to Gilley’s Saloon for the Buckeye Bash, a rally hosted by the Alumni Association. We were able to catch up with President Drake as well as several alumni. We look forward to discussing the bioeconomy with football fans tomorrow at the Cotton Bowl tailgate. What a day for the Buckeyes! We hung around Arlington, talking about biobased products and how to contribute to a more sustainable future before heading into AT&T Stadium to watch the Buckeyes become 2017 Cotton Bowl Champions! It's back on the road tomorrow. Back on the road, driving through West Texas. On our way to Las Cruces, we decided to make a stop that was out of this world. We made a special stop in Roswell, New Mexico to see if we could get a glimpse of some extraterrestrial life. Unfortunately, they didn't have too many pointers on bioproducts and sustainability. Perhaps we'll have to work together to create a a future for us both. New Years Eve in Tucson. It's been a great year for living a biobased lifestyle and we hope that we've encouraged a few people during the Sustainable World Tour to consider their purchasing options next time they visit the store.